Posted on Mon, Apr 9, 2012 : 1:13 p.m.
A picture from October 2011 of the under-construction Landmark student high-rise on South University Avenue. 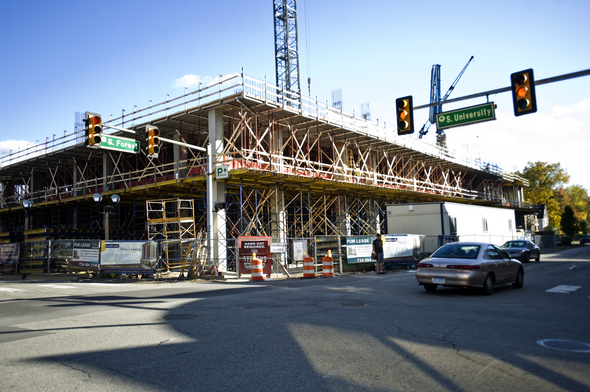 Landmark, the under-construction student high-rise on South University Avenue in Ann Arbor, has secured its first retail tenant: a 7-Eleven convenience store. 7-Eleven plans to open on the first-floor of the 14-story high-rise at 1300 S. University Ave. when it opens this fall. The high-rise has room for about five retail spaces, with frontage along South University and South Forest. Ann Arbor’s Colliers International is marketing the space for lease for an annual $45 per square foot. The 7-Eleven on South Main Street near downtown Ann Arbor. JJ Smith, executive vice president of development and construction for Landmark property owner Campus Acquisitions, said 7-Eleven will be located adjacent to and have access from the building’s lobby. The space, he said, is roughly 2,500 square feet. Colliers’ Jim Chaconas said 7-Eleven will bring in a franchise owner to run the store. 7-Eleven spokesperson Margaret Chabris said the franchise owner has not yet been selected and interested parties can apply on the company's website. 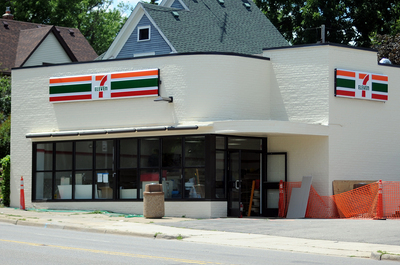 This will be 7-Eleven’s third location in the downtown Ann Arbor area, after two stores opened in 2011. The first opened in January 2011 at 318 S. State St. in the 5,500-square-foot former Ritz Camera building. The second opened in August 2011 at 704 S. Main St., just south of downtown. The international convenience store chain, which has more than 44,000 outlets in 16 countries, has been expanding throughout all of Michigan in recent years. Chabris said 7-Eleven is interested in finding more sites in the Washtenaw County area. Wed, Apr 11, 2012 : 2:56 a.m.
Three 7-11 stores in town is hardly outrageous, the East-Ause suburb I originally hail from is a smaller city with far more than three 7-11 stores, frankly I was shocked that the only one in the area was out at Ellsworth and Hewitt when I moved here! There was one practically every other block back home. Not to mention the number of Jimmy John's, Starbucks, Biggby and Subway restaurants prove that redundancy isn't a bad business decision in this town! Tue, Apr 10, 2012 : 4:18 p.m. I agree that I too would rather have Tim Horton's. Three is a little much in the area for 7 elevens. Hopefully some more small business opportunities will be available so some unique AA entities can develop. Tue, Apr 10, 2012 : 4:07 p.m. I feel like they're the equivalent of pop up ads on the internet. Tue, Apr 10, 2012 : 6:22 a.m.
Three 7-11's downtown? Really? Kids must love these things. Maybe 7-11 got the lease because they carry asphalt patch. They'll sell a bunch of it for those wanting to repair Forest. Mon, Apr 9, 2012 : 8:04 p.m.
Mon, Apr 9, 2012 : 7:20 p.m. Very poor choice. Why not just line all of S Univ with more franchises and national chains? Make it easy on the landlords so they don't have to force out any independently owned stores or restaurants. It's all about greed, folks. Just turn S Univ into a bland strip mall and be done with it. Take all the uniqueness out of the area and what do you have left? Bland, predictable stores and chain restaurants serving overpriced, mediocre food. Everyone is trying to &quot;cash in&quot; on the student population, but the only winners are the landlords. &quot;Chabris said 7-Eleven is interested in finding more sites in the Washtenaw County area.&quot; Good news. Even more of these dreadful chains will populate the county. Tue, Apr 10, 2012 : 1:42 a.m. I agree, the fact some independent businesses are unwilling or unable to pay their employees poverty wages means they deserve to go out of business and have to work for said competitors for minimum wage. Mon, Apr 9, 2012 : 11:58 p.m. So tell us what &quot;chains&quot; have taken over SOuth U? Blue Leprachan? BTB? Pizza House? Good Time Charleys? I know all the people who love Applebees and Chilis are thrilled with the 10 of them in downtown Ann Arbor. You are deluded. How about walking up and down South U, and tell me there are no independent businesses in the area. By the way, there was a McDonalds, and a Borders Books downtown as chains and they closed. Some businesses fail. It is called the real world, If the independent s do not make themselves BETTER than the chains, they deserve to go under. Mon, Apr 9, 2012 : 7:17 p.m. I wonder how the wine selection will compare with VC's. Mon, Apr 9, 2012 : 7:05 p.m.
Three 7-11's in ann arbor are they competing with Starbucks for most locations here? Mon, Apr 9, 2012 : 6:39 p.m.
Those dark winter nights when you would like to have a little dollop of something to put the tykes into dreamland have seemed even longer since VC closed. I hope this 7-11 has a liquor license. Mon, Apr 9, 2012 : 6:21 p.m. Boy I'm glad Village Corner was shoved out of downtown to make way for such a high profile acquisition as a 7-Eleven! My god, downtown is really going places now! Mon, Apr 9, 2012 : 6:57 p.m. Yes, that was the real reason why VC had to move. The apartment building on top of the 7-11 is just a happy coincidence. Mon, Apr 9, 2012 : 5:57 p.m. I'm with people on the whole anti-chain thing in general, but it's not like all the &quot;local&quot; junk food-alcohol stores add that much character to the town. Village Corner was a bit of an exception in that regard, granted. Mon, Apr 9, 2012 : 6:07 p.m. But, the Slushies at the locally-owned stores are made with organically-grown, fair-trade, free-range, locally-sourced, ethnically-sensitive ingredients! Mon, Apr 9, 2012 : 5:54 p.m. Walked down State Street for the first time in a long time the other night. Franchises are taking over Ann Arbor. But that's what the people want I guess a characterless town like they came from. Pretty soon Ann Arbor just won't be &quot;so special&quot; will it? It will be just like any other Detroit suburb. Tue, Apr 10, 2012 : 10:01 p.m.
@johnnya2 - Yeah, neither were Shaman Drum, Possh, This n That, Champion House, Squares, Emerald Dragonfly, Michigan Book and Supply (soon), etc.... etc..... The independents keep dropping like flies and the primary reason is that they can no longer afford the rent. Tue, Apr 10, 2012 : 1:05 p.m. I too miss some of the small, locally owned businesses with character that used to be everywhere in downtown A2 and I appreciate the ones that have managed to stick around. I used to work in several different jobs that brought me in close contact with UM students (driving a cab and working at Pizza House). I would often hear the new students when they were so excited that one of the chains they were used to had a store here in town. While I do agree that some of the rents being charged in the downtown area seem excessive (to me personally) it really seems that the college students these days much prefer to patronize the big chains where they know what to expect. Tue, Apr 10, 2012 : 1:39 a.m.
Landlords make a lot for doing very little. Inherit a nice property downtown and you will never have to work a day in your life - turn it over to a management company and just let the checks roll in. This is why I got into this business. Keep slaving for me, worker bees, I enjoy the honey. Mon, Apr 9, 2012 : 11:54 p.m.
Really? So Whites Market, Sava, Mr Greeks, the State Theater, Stucchis, MDen, Tortoro, Amers, Red Hawk, Ashley's , Bivuoac, Bells Pizza, Pizza Bobs, Mr Spots, Quickie Burger, Campus Corner, State Street Barber Shop are all national chains. I also think any person who says it is greedy landlords, must tell us every time they sell their house or buy a car that they did not try to get the best deal for themselves. They must sell their house BELOW marker value, so that a person they like buys their house instead of a person who can afford it. Your arguments are ridiculous and hold no basis in reality. Mon, Apr 9, 2012 : 7:11 p.m. It's about greedy landlords. The only tenants who can afford the rent are homogeneous chains, devoid of all character and uniqueness. The franchise takeover is less a result of consumer preference than it is the effect of commercial leases making it impossible for locally-owned businesses to turn a profit when renting space downtown. The landlords have priced everyone but national corporations right out of the market. I'd rather have a Tim Horton's. But it is what it is. No no no... A chain coffee and donut shop will surely destroy all that is unique about downtown Ann Arbor! Mon, Apr 9, 2012 : 5:29 p.m.
Mon, Apr 9, 2012 : 10:56 p.m.
Oops. I accidentally voted up on this comment. So now I'm going to claim that A2Kid meant this sarcastically, and I did too.